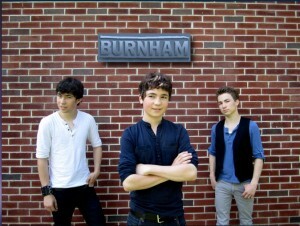 Today I’m very happy to be able to ramble on with the brothers Burnham. They’ve been performing together for half their lives, but after meeting producers Freddy Shehadi and Andy Marvel of Headspinners, things moved to a whole new level. A demo with Headspinners led to a meeting with Island Def Jam CEO Antonio “LA” Reid. Reid refused to let the brothers leave without being signed. The fact that youngest brother and lead singer Forrest beat Reid at pool before signing is bound to become one of those classic music industry stories. They’ve since worked with a number of well-known producers and songwriters on their debut, including OneRepublic’s Ryan Tedder (on the track “Catch Me If You Can”). They’ve also weathered Forrest’s voice change with the help of expert vocal coaches. In October, Burnham will open for All-Star Weekend at the Topsfield Fair in Topsfield, MA, and then go on a several month, multi-city tour sharing the stage with Action Item and Hollywood Ending. ANTHONY: I’ve been waiting months to be able to type this. Ladies and Gentlemen, please welcome brothers Forrest, Alex and Andre, better known as … BURNHAM! Hi, guys! BURNHAM: Hey. How’s it going? A: It’s going well, thanks. The best place to start this is probably with a question about influences. Who do each of you count as your primary musical influences / heroes? B: You probably heard this before but Coldplay, The Beatles, and Led Zeppelin, The Who and currently Bruno Mars, OneRepublic, Kings Of Leon, etc. A: As a three-piece “band of brothers,” you’ve been compared to Hanson, the Jonas Brothers, and fellow up-and-comers Kropp Circle. We know what you have in common with those bands … what sets you apart? B: Well, there are many brother bands even ones like Kings of Leon and Van Halen so it isn’t that uncommon. But every band is set apart by their uniqueness of sound. When you hear Kings of Leon you know it’s them. When you hear Hanson you definitely know it’s them. We hope to bring that to our audience. A: Good point about KoL and VH. I first became familiar with you through the covers you were posting on Youtube. What goes into deciding which songs you’ll cover and what format you’ll use (acoustic vs. electric, etc)? B: Usually, we decide to cover songs that we love and songs that the audience already knows and loves. A: How much effort goes into making a version that is uniquely “Burnham” while still retaining what is loved and recognizable about the original? B: We love playing acoustic. It’s how we got signed— with a couple of guitars and three voices. We think our front man brings uniqueness with his voice. A lot of effort goes into each song but after we learn it we hope that it becomes our own. A: Will you be doing the “12 Covers of Christmas” project again this year, or will your upcoming tour with Action Item and Hollywood Ending interfere with that? B: Well, we did that after the Bieber tour and it was “let’s learn this song quickly today so we can get it on Youtube for our fans.” We had to learn a song a day if we didn’t know it already. Forrest is a quick study. We might do it again. It was pretty fun. A: I think it was fun for the fans as well. Okay: last, and possibly the most important, question about cover songs: When are you going to cover “Come On, Eileen” by Dexy’s Midnight Runners? Your mother wants to hear you do that almost as much as I do! B: Ha ha. We joke about the 80’s to our mother. It is a cool song but we might try another 80’s song at some point. We mostly like to cover current songs though. A: In other words, “Anthony, Stop Tweeting about ‘Come On, Eileen!’” haha Okay, now, let’s talk about your original songs. We’ve seen Youtube footage of Forrest working on a song at the keyboards, but what’s the full-band creative process like? How do you decide who writes lyrics, who writes melody, etc? B: We don’t decide who writes what. Sometimes it’s Forrest or Alex or me, Andre. When you have a song idea you just start working on it. Sometimes it’s just the melody. Sometimes it’s making a track in our home studio. Sometimes one might come up with lyrics and then someone else has a better idea. Any original we have is all of ours together. It’s really an amazing feeling when you finish an original song. A: When you’re starting to develop a song idea, do you ever think far ahead to how the song will fit into an EP or full album, or do you let each song tell its own story in its own way? B: No. We never think ahead. A lot of songs get put to the side. You have to be able to say goodbye to a song that just doesn’t work or maybe you will use that idea later. A: As a writer, you can imagine I’m not a fan of the “where do you get your ideas” question. But I do like hearing about tactics and tools. When you’re stuck for a lyric or idea, where do you turn for inspiration? What do you do to break a creative block? B: It kind of just comes for all of us. Sometimes we get an idea for a song and it get recorded and sits there for months and then we go back and come up with a new lyric idea for it. We usually write words that just pop into our heads. A: Have you collaborated with anyone on songwriting chores? And if you could collaborate with anyone, who would it be? B: We have collaborated with many people and in the beginning before we ever got signed we collaborated with our two producers. We have collaborated with Ryan Tedder of One Republic, James Bourne of Busted, and many producers in the business that have collaborated with Katy Perry, Justin Bieber, and artists like that. B: Like we said before we abandon song ideas a lot. We even abandon whole songs. Well, not really abandon it’s more like put them away. We never throw them out. A: Andre, you’re building amplifiers these days, right? How’s that going? B: No. It’s me Alex building cabs. It’s going amazing. I am working on custom orders right now for Burnham Custom Amplifications and already made a cab and head to bring on The Stronger The Love Tour. A: I’m going to just pretend it’s all the “A” names confusing me to explain why I aimed that question at the wrong brother. Forrest, I’d get in trouble with my nieces if I didn’t ask this question: when is your episode of BIG TIME RUSH going to air, and what was it like working on the show? B: We are not supposed to say the date but I can tell you that it is in October sometime. A: Alex, rumor has it (okay, it was actually Andre on Twitter) that Forrest recently dropped a motorcycle on your head. What was that all about? And will there be retaliation? B: Funny. Yeah, Forrest was on our uncle’s dirt bike and it was in the garage. I was working on one of my cabs and Forrest lost his balance and the bike kind of fell on me. I had a headache for two days. I already retaliated but I can’t say what I did haha. A: It’ll all come out in the Unofficial Biography someone will publish about you guys in a year or two. One of the many things that impresses me about you is your commitment to your fans. Your weekly ustream sessions have gone without missing a week for how long now? Tell my readers when and where they can find the live chats. A: You’re about to head out on tour, as we mentioned earlier. What’s the most exciting part of touring, and what’s the most grueling? B: The most exciting part about tour is performing and meeting the audience. We like the meet and greets before the performance because we can recognize the people in the audience that we just met. It was pretty cool. The grueling part is the long miles in between shows and getting up when you really just want to sleep in. Packing up in hotels is tiring too. You don’t want to leave anything in a hotel room because you can’t go back and get anything because the schedule is just that tight. A: Since I travel about one-third of the year for my day job, I can relate to the “leaving things behind in a hotel room” problem. I don’t know how many power cords I’ve lost. Right now, three of your songs are available as an EP on itunes. When can we expect a full album to appear? B: That’s the big question everyone wants to hear the answer to. As you know, Forrest went through a voice change so we had to rerecord some songs and it even inspired us to come up with a lot of new ones. We don’t know when we will release more songs or a full album. We just wanna release it at the perfect moment. A: Well, I know your fans, including me, will be ready for it whenever it drops! 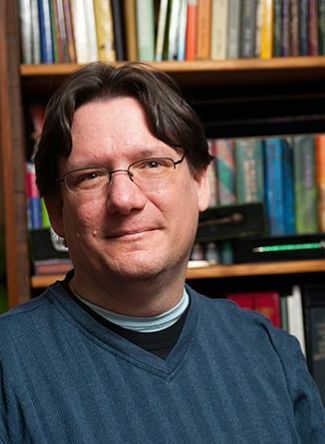 I always wrap things up with this question: What is your favorite book, and what would you say to recommend it to someone who has never read it? B: We argued back and forth about this one but we all agree the Harry Potter series! A: Alright, well, good luck with everything and thanks for the chance to chat, boys!